Rotis are highly addictive. If you are on a diet, please move on to our other fine recipes. 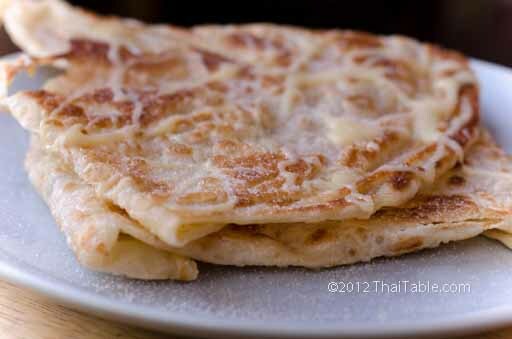 Crunchy crispy roti, topped with sweetened condensed milk and sugar, is always on my 'to eat' list when I visit Thailand. The combination of crispiness, sweetness and saltiness will get you hooked. When I was a kid, a roti wasn't stretched thin like this. It was gathered in a round shape, flattened and fried. 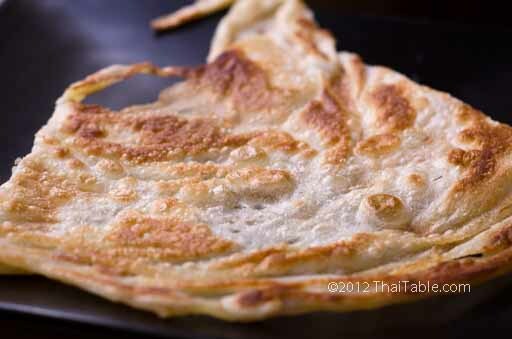 The thicker roti was soft and somewhat crispy, unlike the today's paper thin Crispy Roti that shatters upon contact. The evolution of roti didn't end with crispy frying. Now, you can get Nutella or jam filling, fresh fruit, cheese or even pizza toppings. Rotis are very popular among tourists...finally something that won't burn off your tongue. The amount of ingredients (butter, sugar, sweetened condensed milk and oil) are as needed. I prefer just sweetened condensed milk on my roti. When frying roti, the more oil you add to the pan, the crispier the roti. When slapping down the dough, don't worry about the holes. Continue to work around them. The roti gets really crispy around the holes because these are the thinnest spots. Sweetened condensed milk can be really thick and hard to drizzle when it's cold. Let the sweetened condensed milk sits in a warm water bath. 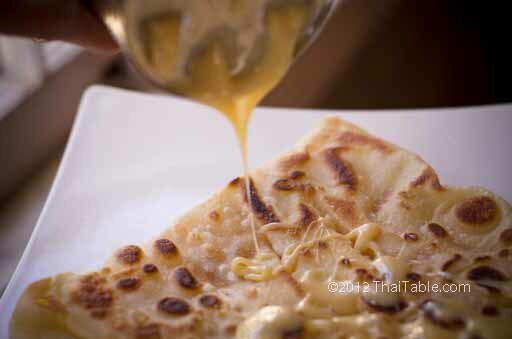 In Thailand, we punch a few holes to drizzle the sweetened condensed milk. But when the sweetened condensed milk gets too thick, I open the can all the way and use a fork to drizzle the sweetened condensed milk. The Roti Dough makes 10 rotis. Scroll down to see the dough recipe. Find a nice smooth large surface you can work the dough on. A stone pastry board or stone counter tops work well. You can also use a large platter like I do. Oil your working surface well. Take a piece of rested dough and press with your fingers to flatten the dough (picture 2). Try to press evenly. Do not push through. The dough should be about 4 inches in diameter. Using both hands now, grab the dough. One hand under the dough with the hand open to the dough. The other hand is grabbing from the top of the dough. Slap it against the platter or surface either left or right depending on your preference (picture 3). 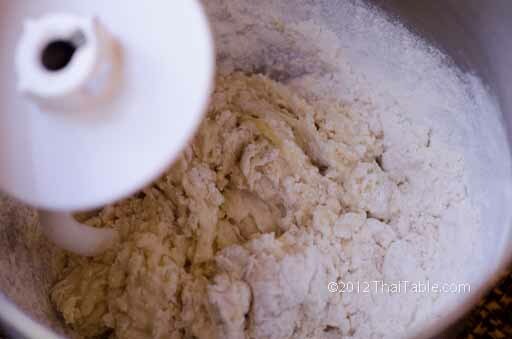 Rotate to the next thick spot and slap the dough hard again. Continue rotating and slapping. You'll start seeing the dough stretched so thin that it appears translucent at some spots. The edges will be thicker, similar to a pizza. The roti vendors slap the dough until it's full size, but I don't have the space. So, I use my finger to stretch the dough at the end. Work on the edges by stretching with your fingers and keep moving and stretching until you've worked on all the edges (picture 4). Stretch out the dough on the oiled surface. 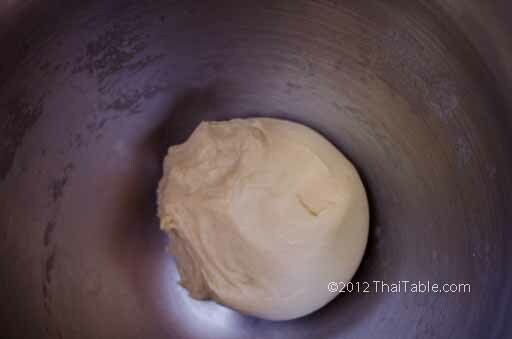 Keep the stretched dough spread out and stretched on the surface (picture 5). I'm frying the dough on a 11-inch griddle. So, my stretched dough can't be bigger than that. Heat up a griddle over medium heat. Add 2 tablespoons of oil. Drop the stretched dough in while keeping it stretched. 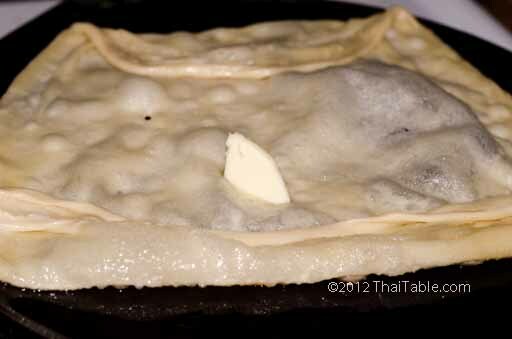 Add a small piece of butter (1/4 of tablespoon) either on top or under the roti (picture 8). Flip and fold the roti in on each side to make a rectangle or square. Flip the roti to brown the other side. You may need more oil. It should not take more than one minute to turn golden brown. Drizzle with sweetened condensed milk as you like (picture 8). You can punch a few holes in the can and let the sweetened condensed milk pour through. If it's too thick to come out, open the lid and drizzle it with a fork. Sprinkle a pinch of sugar. Serve hot. If let cool at room temperature, the roti should still remain crispy. Dissolve sugar and salt in ½ cup of water. 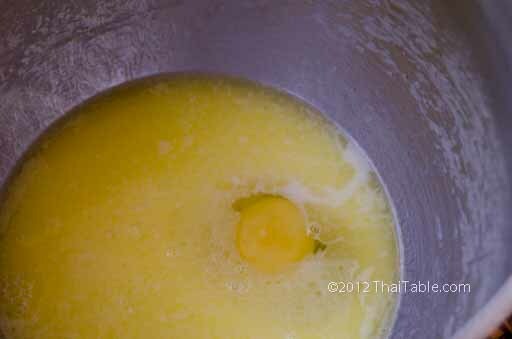 Add milk, egg and melted butter. Beat the egg lightly. Add 3 cups of flour. Knead in a mixer for 15 minutes. The dough should be tacky but not sticking to the container or your hand. This dough is quite wet compared to a regular bread dough. Prepare the dough resting container by oiling the inside of the container and adding some oil on the bottom of the container. Oil your hand. 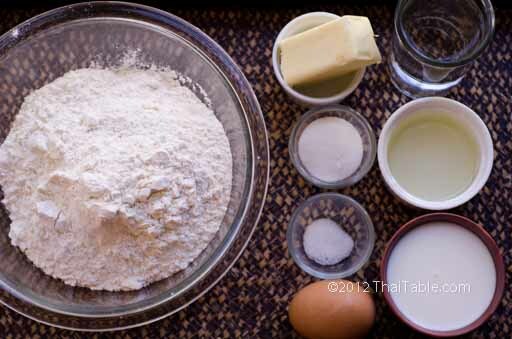 Divide the dough into 10 equal pieces, each about the size of a golf ball or slightly larger. Form the ball by pulling a side of the ball and tucking it in the middle. Rotate and repeat the pulling and tucking until the ball is smooth (picture 5). It should not take more than half a minute per ball. 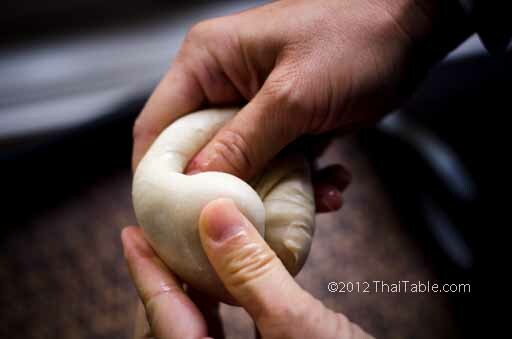 Finally, push the dough from the bottom through the space between your thumb and your index finger (picture 6). The ball should be smooth and tight. Tuck the rest in and pinch it together. Oil the dough ball and place it in the oiled container. 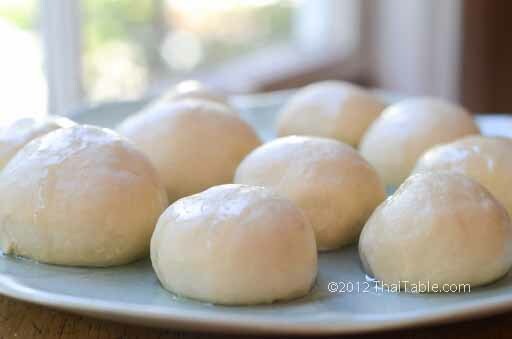 Form the rest of the dough balls and let them sit and bathe in oil for at least 20 minutes. Do not refridgerate. You can leave them out overnight. The resting period is very important; it lets the gluten relax. The relaxed dough is easier to spread out during slapping.